REHOBOTH BEACH — A Delaware pastor who was recently denied a permit to conduct church services on the beach preached to a crowd of approximately 1,500 people on the Fourth of July. 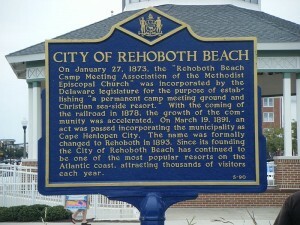 As previously reported, Pastor Robert Dekker of New Covenant Presbyterian Church in Lewes told reporters that he recently submitted a permit application to hold eight church services on Rehoboth Beach beach this summer, but received a letter of rejection from the city manager. However, when supporter Christian Hudson found out about the matter, he decided to organize a freedom rally for the Fourth of July, and asked Dekker to preach a sermon at the event, which had been permitted. Flyers were soon created announcing that Dekker would preach a sermon on the beach called “A Line in the Sand” in defiance of the denial of the permit. According to reports, the event on Thursday far surpassed attendance expectations, with nearly 1,500 people participating on the beach. The area for the rally had been partitioned off, but quickly filled up with attendees, some of which were not aware of Dekker’s situation. Patriotic songs and messages filled the air for most of the event, but Dekker also had the opportunity to preach for just under 20 minutes. “If the city manager were to change all of his decisions — and I was very thankful that he changed his mind that he gave us this permit today; I’m really thankful for that — God is able to bring about change in his time,” Dekker told the crowd, according to Delmarva Now. John Betts of Abundant Life Church in Georgetown also led attendees in corporate prayer.